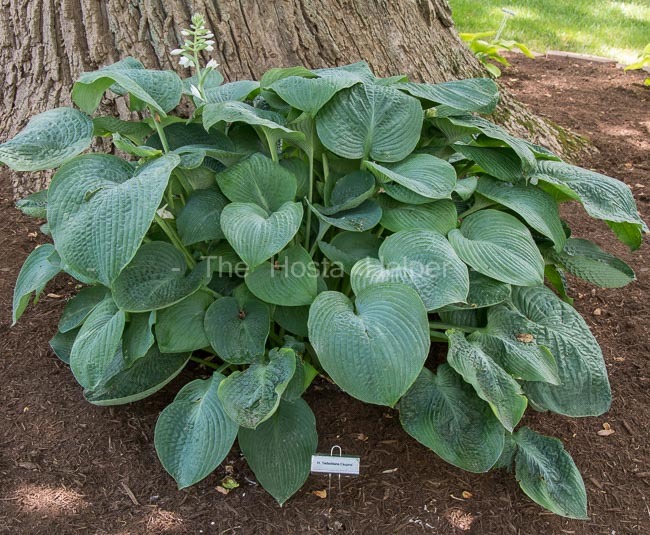 Hosta ‘Elegans’ is THE classic giant size blue hosta. It was originally described as a cross between 'Fortunei' × H. 'Sieboldiana' but, According to The Hostapedia by Mark Zilis (2009), it is "...most likely a cross of H. 'Sieboldiana' × 'Tokudama'." It was first introduced for sale in Germany by Georg Arends in 1905 and The American Hosta Society registered the cultivar on his behalf in 1987 and again in 2002. 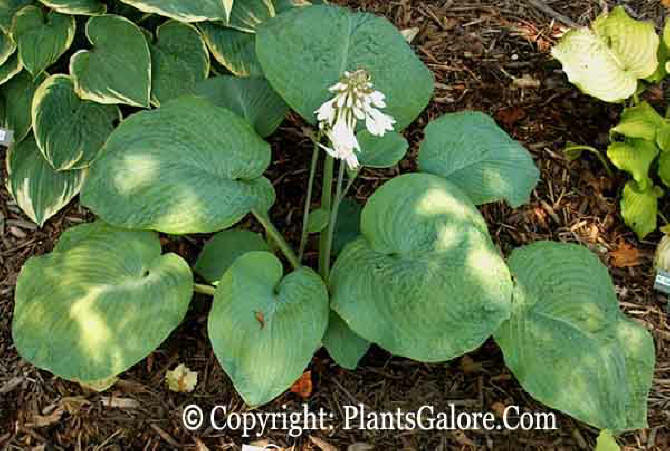 Mark Zilis has called 'Elegans' the #1 hosta introduction of all time. 'Elegans' forms a giant size (28 inches high by 61 inches wide) mound of heavily corrugated, slightly wavy foliage with a deeply lobed base and a distinct tip. It produces funnel shaped, near white flowers in dense clusters from mid-June into July. According to The Hostapedia by Mark Zilis (2009), "When Georg Arends introduced his Funkia fortunei var. robusta, I'm sure that he did not realize the impact that this hybrid would eventually have. In essence, H. 'Elegans' introduced thick substance and blue-green foliage color to the hosta world. 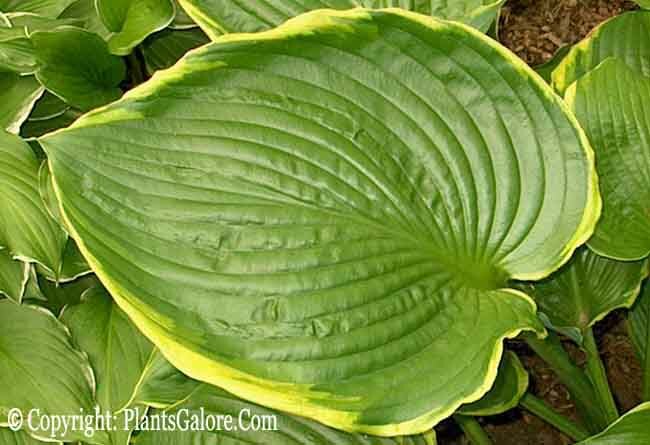 Almost any hosta with these characteristics hearkens back to H. 'Elegans'. ...H. 'Elegans' also has the distinction of being a cultivar, but not a clone. This is rare among hosta cultivars. The reason for this is its sluggish growth rate, making propagation by division a slow task...nurserymen eager to increase their stocks...germinated copious numbers of seeds. Thus, the plants sold as H. 'Elegans' today are far removed from the original 'Elegans' and are not identical to each other." This cultivar has been awarded the Royal Horticultural Society's Award of Garden Merit in the UK. From the Field Guide to Hostas by Mark Zilis (2014), "...remains the standard to which all other large, blue-green hostas are compared...Over the last 30 years, slight differences between 'Elegans' seedlings resulted in several new introductions with heavily corrugated, blue-green foliage. 'Gray Cole' and 'Ryan's Big One' probably come closest to the original 'Elegans', but they are significantly different from other 'Elegans'-types such as 'Blue Mammoth' and 'Big Daddy'." The New Encyclopedia of Hostas by Diana Grenfell (2009) states: "Over the years this name has been applied to a variety of H. 'Sieboldiana' selections and it is likely that none of the plants in tissue culture under this name is the correct plant, which may now only be found in older collections and is likely to be superior in leaf color and shape...Flowers are bunched at the top of the scape, which rises only just above the foliage mound." The Hosta Journal, (2006 Vol. 37 No. 2), contained an article in which several hostaphiles were asked to give a brief list of their favorite hosta flowers. This plant was included in that list. 'Elegans' may have been sold at one time under the name Mackwoods No. 2. Schmid (1991) stated "...The name H. fortunei 'Robusta' was used by Georg Arends in 1905 for the plant that eventually became H. 'Elegans'..."
An article by W. George Schmid in The Hosta Journal (1985 Vol. 16) discusses the University of Munich's trial gardens Staudensichtungsgarten Weihenstephan, "...a fine collection of hostas. These are of great importance from a historical standpoint, because many of the cultivars there came from the early German hybridizers, including Georg Arends. They include H. sieboldii (syn. H. albomarginata) 'Alba Improved', H. ventricosa 'Superba', H. tardiflora 'Hybrids' and H. 'Elegans'." Alex Summers in The Hosta Journal (1995 Vol. 26 No. 2) states that, "H. 'Frances Williams' was registered...without detailed description or photos...the plant was discovered in 1936 by Mrs. Frances Williams...in rows of H. 'Elegans' at Bristol Nurseries in Bristol, Connecticut...Frances Williams sent a division to the University Botanic Garden in Oxford, England in 1959. It was named by George Robinson at a Royal Horticultural Society lecture on variegated plants." In The Hosta Journal (1996 Vol. 27 No. 2) Warren I. Pollock states that, "H. 'Blue Angel' is one of the best large blue-leaved hostas. The leaves are more pointed and less seersuckered than those of H. 'Elegans' . I happen to think the leaves are a good blue color; there are other big hostas with bluer leaves...it is a faster grower than H. 'Elegans' ...an exciting new sport of 'Blue Angel' ...H. 'Guardian Angel' is a blue-leaved hosta with an attractive, wide center variegation....Not surprisingly, 'Green Angel' is the green sport." Pollock continues in The Hosta Journal (1997 Vol. 28 No. 1) writing, "There already is a blue hosta with the leaf curling character of 'Stetson'. It is a seedling of H. 'Sieboldiana' (not H. 'Elegans' ) with pollen parent unknown. The leaf blades are canoe shaped, even more curled on the sides than 'Stetson'. Its very fitting name is 'Blue Canoe'...an exciting new introduction of Gwen Black who gardens in...England." An article about H. 'Great Expectations' by Warren I. Pollock in The Hosta Journal (2000 Vol. 31 No. 1) reports that John Bond wrote, "I became aware of an obvious sport on a substantial clump of H. 'Elegans' ...in the rhododendron species collection in the Valley Gardens in Windsor Great Park during the early 1980s. After a year or so I decided to remove this sport for it was clearly promising to say the least...The three "cuttings" were carefully planted in a sheltered corner of my own garden...The following spring produced three nice little plants...Rightly or wrongly I gave Paul Aden [Baldwin, New York] one of my plants and the remaining two were transferred to the Savill Garden from where sadly they were both stolen!...So that is the very simple story and explains that there was no mysterious breeding programme and also that H. 'Frances Williams' had no part to play." In The Hosta Journal (2001 Vol. 32 No. 1), Tom Micheletti, former President of The American Hosta Society took on the task of listing the "Classic Hosta Cultivars" through the year 2003. He decided to divide these into categories including: Green, Blue, Yellow (Gold, White-Margined, Yellow-Margined, White Medio-Variegated and Yellow Medio-Variegated. He writes that "No other genus in the plant kingdom has as many blue-leaved variants...Grandaddy of the blues would be H. 'Elegans'. H. 'Tokudama' would be the other parent that has passed along the blue leaf characteristics." An article about the Halcyon Group written by Peter Cross in The Hosta Journal (2004 Vol. 35 No.2) says, "Though 'Halcyon' is not the bluest hosta now available, no blue hosta has yet to match the balance of color, size, habit and growth rate that has made 'Halcyon' the classic medium-sized blue hosta...One simply doesn't have a hosta collection until it contains at least one clump of 'Halcyon' ...is a first-generation member (TF 1 × 7) of the legendary Tardiana Group of hostas, which consists of hybrids of 'Tardiflora' × H. 'Elegans', produced in England by Eric Smith, the master hybridizer of blue hostas, in the 1960s." The plant above was labeled "H. ' Elegans' - gold"